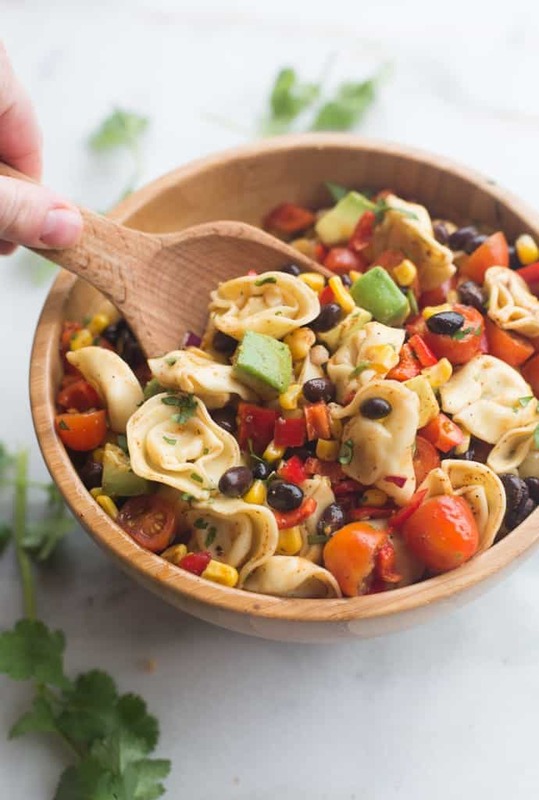 A fresh and easy southwest tortellini pasta salad that can be made in less than 30 minutes! It’s loaded with veggies and protein and coated in a deliciously simple and healthy southwest dressing. If I had it my way, I’m pretty sure I could live off of pasta salad. I think I’ve mentioned that before. I have a ton of various pasta salad recipes on my site because they make a great main dish OR side dish! You can usually customize them with ingredients you already have in your pantry too. 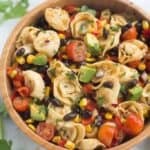 One thing I especially love about this Southwest pasta salad is that it’s made with TORTELLINI! Tortellini pasta are pretty much a staple in my freezer. They’re perfect for nights when I need something really quick to throw together, and my family loves them! 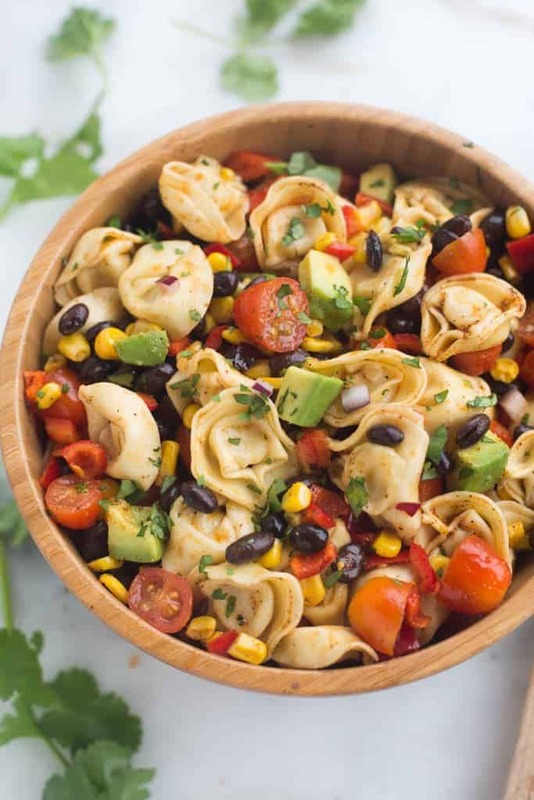 A few of our other favorite tortellini recipes include One Pan Lemon Chicken Tortellini and Creamy Tomato and Spinach Tortellini. Cook the tortellini, chop the veggies and make the dressing on the side. Then combine everything right before you’re about to eat! It’s already a really quick dish to prepare, but doing those things ahead of time make it the perfect side dish to dinner, BBQ’s or any type of event where you have to bring a side dish to share. Refrigerated cheese tortellini are the best kind! It’s a great healthy meal your family will love! This is one of the healthier meals I like to feed my kids. They LOVE it, and I love that it’s loaded with veggies and good protein from the beans. The dressing is pretty mild–definitely not too spicy for my family. If you do want to add a little “heat” to the dressing you could add some Valentina hot sauce. 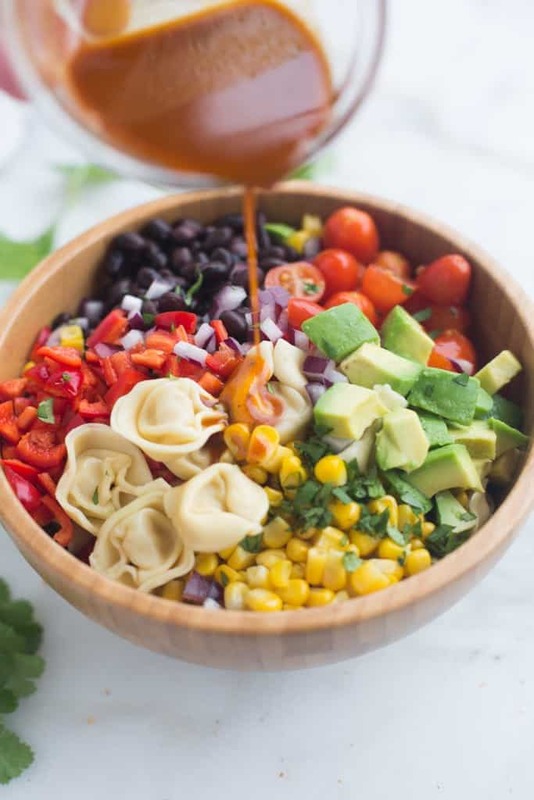 This easy southwest tortellini pasta salad is ready in 30 minutes, loaded with veggies and protein and coated in a delicious and healthy southwest dressing. Add tortellini to a large bowl. 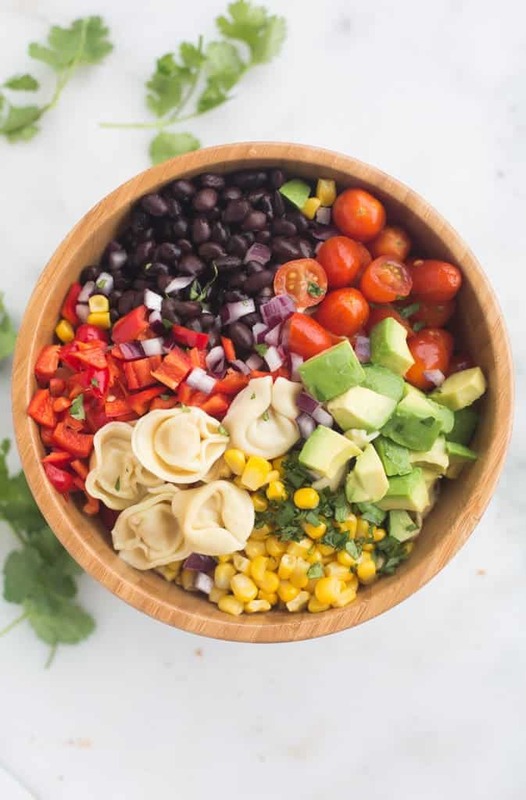 Add cooked corn, black beans, bell pepper, avocado, cherry tomatoes, onion, and cilantro. Combine all of the dressing ingredients in a resealable jar. Shake until combined. Pour desired amount of dressing (you may not want to use it all) over the pasta and toss to coat. You might also enjoy Creamy Pesto Tortellini Pasta Salad. Tips for making this ahead of time are listed in the post above. Absolutely delicious! I’m going to use that dressing with my taco salad, too. We now have another favorite pasta salad. Not sure as to how many packages of tortellini are used. Thanks! Thank you for all your recipes, they all look amazing. I love trying new recipes, can’t wait to try some. Can you use lemons instead of limes? I have made this many times for potluck dinners, etc. and this recipe is always a HIT!! Do you think substituting the sugar for Truvia/Stevia would work?